I would have to say that New Orleans Square might very well be my favorite section in all of Disneyland. From the eerie grandeur of the Haunted Mansion to the minute details throughout that evoke the jewel of the Gulf Coast, there’s real life, drama and class in every corner. All the space is perfectly proportioned, too, without an ounce of fat. Everything makes sense. Here, it seems, no corners are ever cut. Magnificent! Happily, all of the food establishments in New Orleans Square are just as quality-driven. I can’t list one place there that is even average, not even the food carts. What brings out this special magic? It’s hard to say. Maybe because people associate New Orleans with food excellence, the park felt morally obligated to step up their game. It does not make sense that a section only a few feet away (like Frontierland) can produce food of such a different quality, but I swear it’s true, folks. I don’t think you can do better in the park, for price, value and overall appeal, than the French Market Restaurant. Located attractively by the train station, facing the Rivers of America, this is a wonderful establishment that is considered casual dining, moves like quick service, and gives you the feeling that you are truly somewhere special. The Blue Bayou has all the reputation (and prices to match! ), but I honestly feel this is the gastronomic heart of New Orleans Square. In the open-air dining area, you can watch people casually strolling by as you listen to live jazz and sip a (non-alcoholic) Mint Julep. No matter how harried things can be, this festive environment has a way of soothing the mind, even in the dead heat of summer. All of the elements that make the park so great meld here in this one spot: the trees, the architecture, the smatterings of kitsch, the whimsy, the charm. You could ask for no better backdrop for a meal, I can assure you! The food is just great. Given the constraints of food service in this capacity, they do some really amazing things. 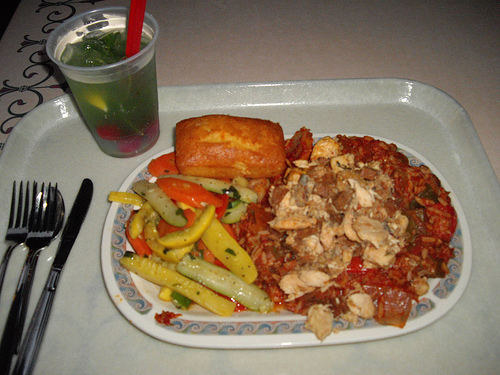 The jambalaya is not your typical Cajun style (this is Disneyland, after all, so they don’t really over-spice), but I really love it. They spoon a large ladle of tomatoey rice with vegetables, make a deep well and top it with a generous portion of shrimp and chicken. Flanked by cheddar cornbread and perfectly cooked tender-crisp vegetables, it’s a marvel. I had this very meal outside in the pouring rain, underneath a small cloth cover, and had one of the most pleasant eating experiences in my life. Every time I have come here, either with a group or by myself, I have been nothing but satisfied. Some of the food isn’t always tip-top — it can happen, and it’s understandable. On one visit my Roast Beef Royale’ had somewhat gummy potatoes, and the beef seemed a bit over-tender (if that even seems possible), but it was all still highly edible. The consistency of the French Market still tops that of the other restaurants in the park by a wide mile. They also have lovely desserts. I had a mini cheesecake with raspberries and a Jack Skellington head perched atop — it was something you would expect to see at only the fanciest of cafes, and was available here for a modest fee. Again, just magic. If you really want to put a big exclamation point of your Disneyland experience, I would strongly suggest you eat here. It is everything the park should be, and if I didn’t already vow to eat at every restaurant in the park, it would be the only place I’d ever dine. I was at Disneyland the other day, consuming several large cups of the coffee with endless refills, bouncing gleefully over my recent discovery. Once I found out about this treat (available only at the Market House on Main Street U.S.A.), I figured it was time to grind it into the ground and drink all I could. On a regular visit, I can easily consume six of the 16-ounce cups over the course of a day. They say it’s not great for your nerves, causes acid stomach and will discolor your teeth, but I never cared. Everything sort of changed this last weekend. I don’t know if it was the madness of Midway Mania (the ride I just stepped off of) or the 3 cups of coffee that I had within a small window of time that caused it, but my hands started to shake. I tried to hold my hands still. I could not. My friends all surveyed the situation, with great glee, and came to the same conclusion: I had overdosed on coffee. I realized that if I ever hope to maintain steady hands and not come off like a knock-off version of Kate Hepburn, trembling like a feather in a breeze, I had best put on the breaks. So, for a time, I will stick with Sanka and ride that train around the park until I feel it’s time to step off. I’ve long kept non-caffeinated products in my larder. I have several jars of Postum hoarded, of course, but I will only partake on special occasions since it’s no longer in production and as precious as gold. Pero is quite good, though not the same as Postum and does not feel like a coffee substitute — it is it is its own thing. The only legitimate solution is to swim in Sanka, my faithful instant friend. A part of the Maxwell House family, Sanka is America’s first brand of instant coffee, dating back to the early 1900s. The younger ones won’t recall this, but for many years Sanka (and Postum for those of the Mormon persuasion) were regularly served at major restaurants. You didn’t ask for a cup of decaf: you asked for a pot of Sanka. Its impact is still felt — though most establishments no longer serve Sanka, the orange color of the product’s label is the main reason why they use orange to identify decaffeinated coffee in restaurants to this very day. I won’t say it tastes as good as regular coffee, because it doesn’t. The slogan “Sanka… Everything You Love About Coffee” is somewhat misleading. Like other substitutes, it has its own character and drawbacks. I’d say it’s slightly bitter, and doesn’t even smell like regular coffee. But if you like the taste of instant coffee (and I do once in a while), you learn to live with it. Naturally, my love for Sanka goes deeper than just my want to calm my jangled nerves. Sanka was a sponsor of The Andy Griffith Show. Back in the day, many of the key products were worked into little commercial skits featuring the characters. If you were not paying full attention, you would swear these spots were part of the actual episodes. Andy and company really sold the Sanka well — to this day, the spots make you want to run out and buy the stuff. And when you sip it, you feel like you’re in the sheriff’s office, gnawing on one of Aunt Bee’s fried chicken drumsticks and discussing American history with ol’ Barn. I think it’s now time for me to fetch some boiling water and make myself a cup. Would you care to join me? Friends, please do visit this place. Everything is done with extra care, and the quality is sky high. You’ll fall in love with their stuff, just as I and many of my friends have. There’s sweets and sandwiches and everything inbetween. Good eats! In my quest to eat at every restaurant and food service cart in the park, I’m bound to stumble upon some lemons. Mickey’s Toon Town does not evoke images of grand dining, and the realities are very much the same. The hot dogs were what we expected. No surprises. I opted for the kids meal, since it had a container of macaroni and cheese, and I blanched at the idea of eating another generic hot dog. This was nicely presented in a box with apple slices and a color-changing straw for my small soda pop. I was pretty pleased with the mac & cheese until I tasted some of the product that touched the side of the container. I don’t know what heating method they use, but the styrofoam flavor is rather pronounced and revolting — it actually seeped in to my food. You no longer think mac & cheese after a while: you wonder if consuming this meal is going to kill you or not. I wouldn’t count this as a total wash, but it’s not all that great, either. There are lots of whimsical places for you to sit, and if you’re looking for some cheap regular food, it’s an alright option. Personally, I have no desire to ever come back. For years this was a firm favorite of ours. I never remembered the Village Haus being more than burgers and fries, but all the food was good, easy on the pocketbook, and the restaurant offered playful surroundings that were a feast for our collective eyeballs. We stopped coming here for some reason — why, I cannot say. But with such cheerful memories of the past, and the greatly improved fare throughout the park, I thought this old friend needed to be loved by us once more. First off, the place is rather chaotic inside. I mean, getting through the front door is a battle! Every single table outside was occupied, and there were dozens of people milling around, all looking for a place to plant their group. Inside is no better. We had all assumed this was due to the primo locale and the fine quality within. But if the food was good enough, as we hoped it was, it would be worth any effort on our part to squeeze through the mouse-capped sea of humanity. The line for the food and the entire process that followed was more of the same. It was just a big mess. Granted, it’s an extremely busy restaurant, and the turn-around here is enormous, but don’t you think they would have things under control after 25 years? It was almost like a brand new restaurant with fresh staff, fully unaware of customer service and crowd control. People seemed agitated and almost resentful of one another. The fact that we got a table was a miracle — we had to hover for some time for that achievement, and our food was cold by the time we finally got to it. 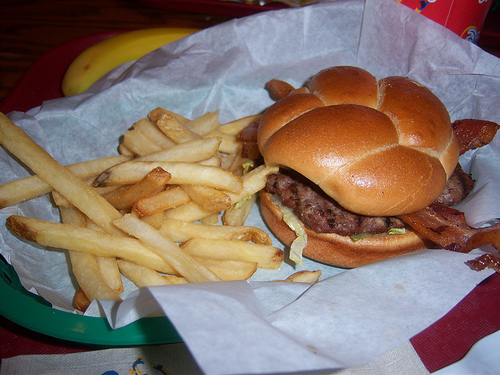 Three of my meal mates had the bacon cheeseburger with fries. I opted for the standard cheeseburger, with a lighter addition of a “salad.” When I saw my “salad,” which fit into something not much larger than a salsa cup from El Pollo Loco, I almost wanted to laugh. I suppose this was a healthier choice through attrition. The burgers were all dry and tasteless, from the bun to the meat. We understand that meat has to be cooked well in order to be completely safe in most high volume institutions, but does the very life need to be taken from it, as well? The beef could have used some serious seasoning, and the buns should have been at least steamed back to a more pliable state. When you eat a burger and notice the predominant taste is lettuce, and your condiments shine through like the morning sun, you are not in very good territory. The “salad” was fine, but it was so dang small, I was eating it in slow, methodical bites just as one would eating in a swanky restaurant to maximize their enjoyment of an over-priced nouveau appetizer. As we ate, the table vultures were swarming with reckless abandon. This just compounded our unhappiness. All we wanted to do was grab our things and get the heck out of there. Seriously, it was like being at a McDonald’s in a bad neighborhood, watching people two tables down get in a shouting match. So much for being the Happiest Place on Earth! We all agreed after the experience to never come back here, that any nostalgic heart strings once pulled by the Village Haus had snapped. If Pinocchio has no strings to hold him down, you can bet he’s running out of that place just as fast as we are. I give it a higher grade than I otherwise would based only on the fantastic look of the place. You can ignore the idea of eating here completely, especially if you have a group. I say look at it while you walk to another establishment and enjoy the rest of your day. Danny Deardorff is not your typical musician, neither visually or thematically. In a world that often judges you at face value and latches on to the more familiar, it’s wonderful to see a man like Deardorff doing what he loves, regardless of preconceived perceptions. And for more than three decades he has inspired people of all ages with his words and music. His songs have a pure sweetness about it them that cannot be manufactured. When you hear them, you know it is coming right from his big heart. On the surface, it might be easy to disregard his sentiments as cornball. Really, it’s just the fact we have become such a jaded society that it’s difficult for us to accept such sincerity. Like it or not, people do genuinely feel this way and should never be embarrassed about it. Deardorff is who he is, regardless. It’s yet another symbol of his tremendous courage. 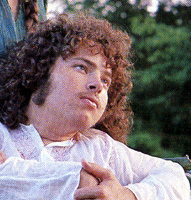 I was first introduced to him through the album Ma La Lady by Danny & Joyce from 1975. (Several of these songs were used on Danny’s best-known album, Deardorff & Joseph, a collaboration with Marcus Joseph.) I don’t know who Joyce is — she is not even listed on the album credits — but it doesn’t really matter. The music is a wonderful time capsule that takes you back to the mid-1970s, reminding you of a much simpler time. His songwriting style is very much rooted in his devotion to the Bahá’í faith — this is lyrically and emotionally evident. “Earth,” “The Little Kings of Earth” and the title track are personal favorites. Deardorff has been recording without pause ever since. Living in the Pacific Northwest, he has done a great deal of work with Tickle Tune Typhoon, who perform children’s shows in the name of love and world peace. Deardorff also operates the Mythsinger Foundation. Now I won’t claim to know and understand everything about him, but I sure do like what I have heard from him thus far, and I certainly hopes he continues making music and following his dreams until the end of his days. 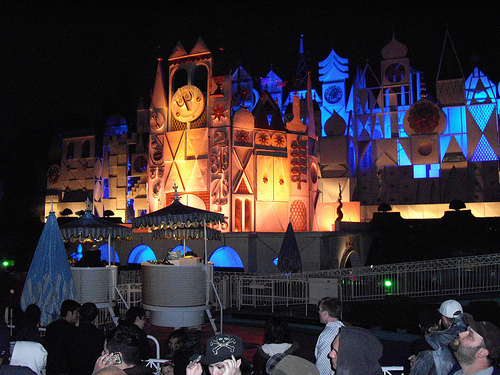 I had heard it was to rain on this day — one I had marked in my calendar for weeks — where the newly revamped it’s a small world would come out of its slumber to enchant the world once again with its sparkling whimsy. I did not care about the rain, nor any obstacles that would be tossed at me. Nothing, but nothing, would deter me from my mission: to have a great time at one of my favorite attractions in the park. Sure enough, it was raining like mad. Californians, at least the ones in the Southern region, have a tendency to act like Armageddon is upon us when even the slightest drop falls from the sky — they lose their ability to think rationally, and, more specifically, seem to forget how to properly operate a motor vehicle. A drive that would normally take me 45 minutes from Downtown Los Angeles was easily doubled due to this irrational fear of water. Sometimes, I feel as if I’m surrounded by distant cousins of the Wicked Witch of the West — nothing else could explain their sharp turn in their behavior whenever presented with anything damp. As it turns out, this worked to my advantage. When I arrived at the park, it was as desolate as can be. I saw a great many people running for cover, or fleeing the park altogether. This gave me a clear shot to go anyplace I chose to go. But, of course, there was only one destination truly on my mind. I went there straight away. This day was a special preview event for season pass holders. it’s a small world would officially open on Friday, but those of us who have passes are often afforded certain perks, this being one of them. I thought there would be a bit of a line, even though the attraction had officially been open for preview since 8:00am. Turns out there wasn’t much of a line at all, and with the rain, there wasn’t much of a general turnout, either, and what was to be an exclusive for folks like me ended up not being so. They had two lines going: one for general guests, and one for pass holders. Folks like me ended up getting what amounted to a Fast Pass, which spend things up nicely. I couldn’t complain. Why did this attraction close to begin with? Well, it was getting old and rickety. Even die-hards like me knew it needed a bit of a facelift, here and there. Certain portions were creeking, mouths were splitting on animatronic children an so forth — it just needed a bit of love to come back to its old luster. Also, the whole thing needed to be retrofitted for the un-anticipated size increase of the average American. 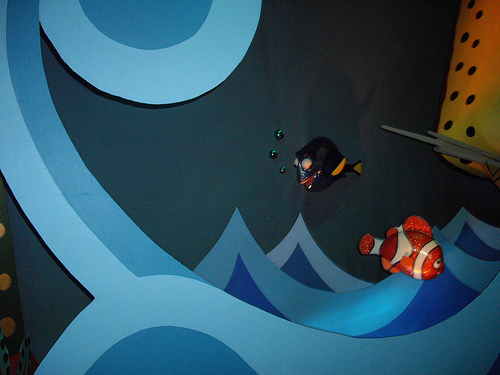 In the 1960s, when this ride was originally designed, people just weren’t that big. Now, with obesity being such a major issue here in this country, a lot of the old technology can’t accommodate the stress placed upon it. I walked on up to the ride, and the first thing I looked at were the boats. They were different, alright, made of the kind of hard plastic that you would see at a children’s play yard. Actually, I thought they looked fine, and they did an excellent job maintaining that same old look. Good job on that, Disney! I had high expectations going in. A lot of talk had been bandied about over what was going to take place inside. I always worried that they would try to desecrate the beauty of Mary Blair’s greatest achievement by removing the very elements that made it so great. Certainly, they had made so-called improvements over the years that had done nothing to display any respect for her style and legacy — colors were always cheap and unimaginative, and the styles were from another play book, where people did not understand Blair’s unadulterated charm and purity. But I had heard on good authority that Disney was determined to bring any of the ill-guided additions out altogether, and replace them with ones that suited the core material. I heard rumors that a great many Disney characters were to be added within — a shocking notion, since that would ruin much of the original intent of the ride. This, after all, was to represent the children of the world, and not little jungle animals who bellowed “Hakuna Matata.” I was told they made additions like this in their Japanese theme park, ushering in high praise. Since that was pretty much confirmed to me by everybody and their mother, I was psychologically prepared for the additions. I just prayed that they would do things right. When I glanced down into the tunnel, my heart sank. 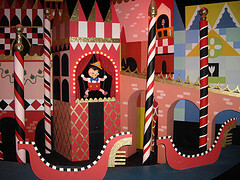 There, creeping slowly towards me, were poor mid-1980s versions of it’s a small world greeting me at the gate. These were the same hokey things that had been there before… and they were not done well at all. The design and color style reminded me of those discount coloring books one sees at the 99-cent stores. Terrible. Not only that, they were cheaply made — almost like out of foam core and balsa wood. Here it was preview day, one day away from the official opening of the attraction, and these pieces were actually starting to fall apart. I mean SERIOUSLY… they were falling apart. I was stunned. Then I saw that sea serpent, which I was assured would be removed. I thought I was walking into the very pits of my worst quality control nightmares. As I went past that bone-chilling opening portion, I was happy to see materials that were familiar and done with class. Of course, there had been changes, here and there, but the overall flavor remained. 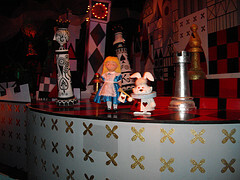 Alice in Wonderland and the White Rabbit were the first big additions I saw. In the new concept, the standard it’s a small world child figurine is decked out like a Disney character, and these characters are sprinkled throughout. Non-human characters are done in a style more in accordance to what Mary Blair’s style dictates. And, in some cases, I have to admit I did not mind what they did so much. If change was going to happen, at least they put forth some effort to get it right. 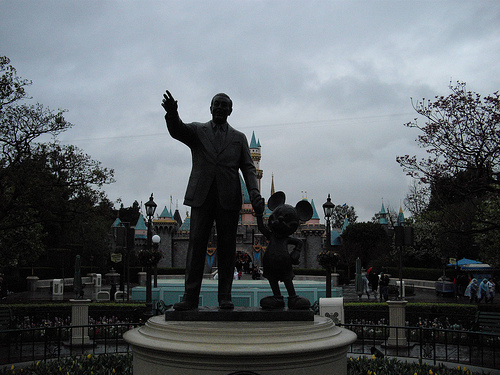 A new soundtrack was also recorded to meld in the themes that match the Disney characters. So, when you see Cinderella, you’ll get a taste of her tune. Peter Pan, Alice — everybody got the same treatment. 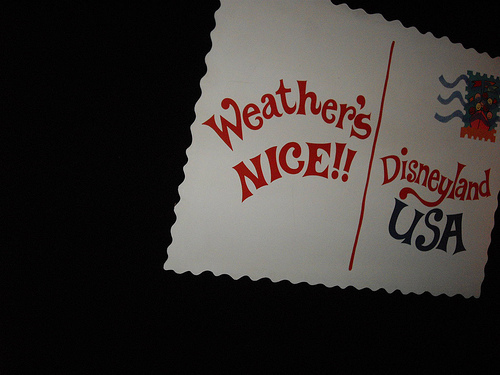 It did not detract too much for the main Sherman Brothers theme, but I will admit it was different. I didn’t think all the additions were good ones. Pinocchio meshed in alright in his modified Vegas-meets-Venice show window. I noticed the colors were just too darn safe — they lacked the spark and the daring that made Blair’s originals so darn extraordinary. This was starting to become a theme in all of the additions: no one really could grasp that magical color style. At some points, it didn’t even look like they tried. For somebody who’s an artist, you can sense where there is passion and life just by giving something a quick glance. Some of this didn’t feel passionate — it felt like contract work. Disney has material that runs the entire gamut, and they made sure to throw in as many characters in as many locals as they possibly could. 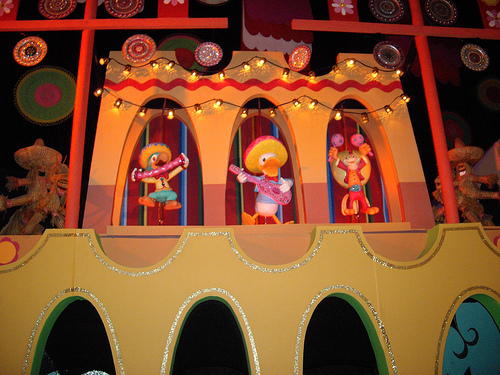 Case in point: José Carioca, Panchito Pistoles and Donald Duck — from 1944′s The Three Caballeros — were placed in the Latin American section. Lilo and Stitch were now surfing in Hawaii. Mushu, the impish dragon from Mulan, was represented by a Chinese kite. Some additions were odd, but I have to admit that many of them blended in without being too distracting. In some cases, it looked like they tried really hard to integrate the characters. In others — like with Flounder, and the fish from Finding Nemo — it looks like they just slapped something in there because they had to. But, I have to say, overall, it wasn’t too bad. Then I went into the new Southwest addition… and I wanted to die. Folks, I cannot tell you how cheap, inappropriate, listless and flat-out horrible the new Southwest addition is. It does not fit it’s a small world in any way, shape or form. This was like a low-budget tee shirt display used at Target. 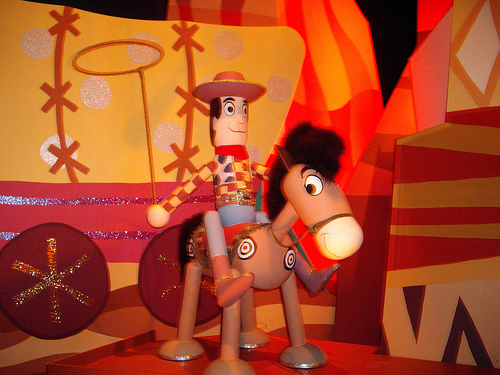 It’s almost as if you are removed from the ride for a few moments just so they can plug their Toy Story franchise. There is nothing redeeming about it. Colors are more literal than imaginative. My heart was breaking as I went through this part. It simply does not need to be there. I mean, why do we need a Xanadu-inspired rainbow dancing underneath spotlights leading us to Hollywood?! Don’t we deserve better than this? After that slap in the face, where the Shemp noise was buzzing around in my brain on a constant loop, I was pleased to end with something more familiar. The big finale is perfectly fine… I just wish its lead-in was a proper one. The exiting signs were just as garish as the ones at the start. No understanding whatsoever about what made this all so great. But, by this point, I was already too tired to fight it. In almost a mocking sense of defiance, one of the postcards read, “Weather’s Nice,” just as I was about to be dumped into the pouring rain. I laughed, yet wanted to cry. I left the attraction somewhat in a tizzy. What did I see? Was it really any good? What’s left of my fond childhood memories? Does anybody know how to design anymore? Is there a line over at the Matterhorn? Where should I eat? Will there be traffic going home? Fortunately for me, I am at my most calm during the rain. And since the park was so empty, I had no one to get angry at. In fact, I was flat-out happy. I could walk where I wanted, ride whatever I chose. The world was my oyster. 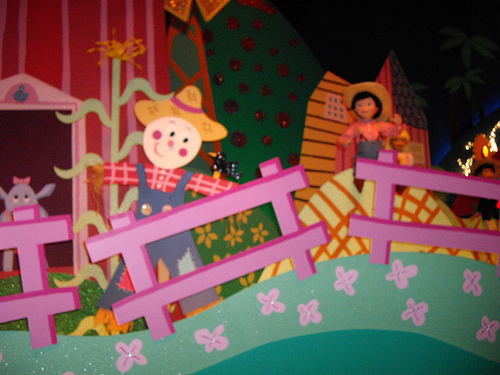 And with this sense of well-being firmly in place, I decided to ride on it’s a small world three more times, to see how my brain would assimilate everything now that the initial shock had worn of. How did I feel at the end? Well, I guess change is going to happen no matter what you do. You either like it or you don’t, but it’s bound to happen sooner or later. The children really reacted positively to the new characters, and there was just enough of the old stuff to make me happy. I guess with all the negatives involved, I can still live with it. 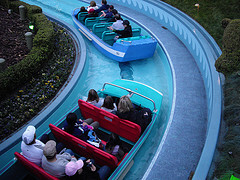 On my final ride, I had a boat all to myself (the park was about to close), and I just gave in to the warmth and happiness that still emanated from what I had known and loved for several decades. So I guess you can say I had the good time I wanted all along.